Migrating north from Africa, the first male common cuckoos (‘cuckoos’) reach Europe in mid-April. In the minds of most country people, spring only truly arrives when the first cuckoo call is heard. The male cuckoo is famous for its’ distinctive ‘koo-kooo’ call, which has been imitated by clockmakers world-wide (the cuckoo clock, where-by rather than the clock chiming, it will make a koo-kooo sound). Females have a bubbly chuckle sound different from the males. The cuckoo is a brood parasite. It is well-known for its habit of laying an egg in the nest of another bird, then leaving the offspring to be hatched and fed by ‘foster parents’. This cunning tactic allows for more young cuckoos to be reared than would otherwise be possible. The mother will try and find the nest later to ensure the foster parents are feeding her chick the right diet for her young, which includes caterpillars, grasshoppers, flies, beetles, and small snails. The cuckoo’s favoured foster parent species include pipits, warblers, dunnocks and robins. Juveniles migrate several weeks later than their real parents, yet they can still find their way to the regular wintering area despite never having visited it before. Cuckoos feed on the ground, but they walk rather clumsily. In flight, a cuckoo can often be confused with a sparrow-hawk with its long, pointed wings and grey-flecked under parts. It is thought that this mimicry may be a deliberate ruse to frighten a smaller bird off its nest, enabling the female to lay her own egg there. While it may be easy to hear the call of the cuckoo, which carried over long distances, sightings are harder as they have a dull plumage and tend to hide within leafy cover. 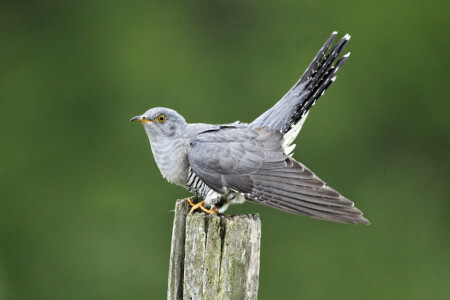 Cuckoos tend to avoid towns and cities, but inhabit various types of countryside, including woodland margins, open farmland, hedgerows and marshes. These habitats are most likely to offer abundant rearing sites. The cuckoo is named in most languages after its call. In France, for example, it is known as the coucou, in Holland koekoek, in Germany kuckuk, in Russia kukush-ka and in Japan kak-ko. The cuckoo has long been associated with fate for humans. Numerous beliefs exist, including: it is good luck to have money in your pocket when you hear a cuckoo; whatever you are doing when you hear a cuckoo, you should repeat throughout the year as the call was a sign that the particular activity will be beneficial; for single people, the number of calls or notes would signify how many years they would remain unmarried; and in Sweden, the direction of the call signifies either good luck (west), death (south), consolation (east), or sorrow (north).